FILE - Suspected illegal immigrants are being processed at the Tucson Sector of the U.S. Customs and Border Protection headquarters in Tucson, Ariz., Aug. 9, 2012. A growing number of immigrants in the United States are being incarcerated in detention centers for increasingly extended periods of time, and without being afforded the legal protections given to criminals, according to a recent report issued by the American Immigration Council. The report, entitled “The Landscape of Immigration Detention in the United States,” says the number of people imprisoned for violating U.S. immigration laws has increased “more than fivefold in the past two decades,” from an average daily detention population of less than 7,000 in 1994 to more than 44,000 in 2017. The rise in immigration detention temporarily dipped in 2014, even though the administration of President Barack Obama increased efforts to deport immigrant criminal offenders and recent border crossers. The Migration Policy Institute attributed this temporary decline in part to improved economic conditions in Mexico and reduced post-recession job demand in the United States. ​The report said that during the administration of President Donald Trump, the number of detentions has “steeply increased.” As of Oct. 20, the average daily population in detention had reached 44,631 people, Immigrations and Customs Enforcement testified to Congress. The report notes that the 2019 U.S. federal budget requests funding for 52,000 detention beds. The increase in immigrant detentions has also been accompanied by a rise in claims of human rights violations, the report said. ​“There are growing reports of civil and human rights violations in detention, including substandard medical care, sexual and physical abuse, and exploitative labor practices. ICE acknowledged at least 185 deaths in detention between October 2003 and July 2018,” the report said. “We’re talking about basic human rights and the bare minimum of legal protections that anyone in any detention should enjoy, the right to speedy trial, the right against self-incrimination, the right to a government appointed counsel, and a ban on cruel and unusual punishment,” said Kathryn Shepherd, the American Immigration Council’s national advocacy counsel. 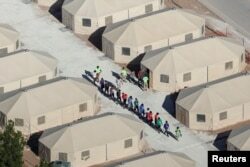 Immigrant children, many of whom have been separated from their parents under a new "zero tolerance" policy by the Trump administration, are being housed in tents next to the Mexican border in Tornillo, Texas, June 18, 2018. The Trump administration has demonstrated a willingness to hold immigrants whether they cross legally or illegally in detention. It’s “zero tolerance policy,” announced in April, mandated that anyone who entered the country illegally should be charged as a felon and incarcerated. Under U.S. law children cannot be held for more than 20 days with a felon parent, so border authorities separated children from their parents. Attorney General Jeff Sessions, cited a “crisis at the border” when announcing the policy, as a caravan of migrants, mostly from Guatemala, Honduras and El Salvador, approached. It was reversed in June because of strong public condemnation. A federal judge subsequently ordered detained families be reunited. A woman from the Mexican state of Michoacan who did not give her name stands with her daughter as names are read off a list of people who will cross into the United States to begin the process of applying for asylum, July 26, 2018, near the San Ysidro, Calif., border crossing. Under U.S. law, immigrants may seek asylum if they can demonstrate a “credible fear of persecution or torture” if sent back to their home countries. In the past, asylum-seekers were often allowed to return to the local community to await their day in court, but the Trump administration has increasingly moved to force them to remain in custody until their cases are resolved. However, since zero tolerance was ended, people with children are often once again released into the community. Some asylum-seekers have been surprised to be sent to detention facilities while their cases are under review. “I was told I was going to be taken to a jail. So at first I wanted to return back to Nigeria because I had never been to a jail before. So why would you take me to a jail? So it was like shocking for me,” said Edafe Okporo, a gay activist whose life was threatened in Nigeria. After requesting asylum he was held in detention for five months in 2017. The American Immigration Council argues that detaining legitimate asylum-seekers is for the most part unnecessary. “A lot of the people who are in detention facilities are not flight risks, are not dangerous to the community, and many of them have demonstrated that they have somewhere to go and that they will show up at their future hearing,” Shepherd said. A unit of the Northwest Detention Center in Tacoma, Wash., Oct. 17, 2008. 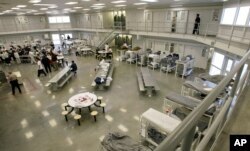 A human-rights group wants the federal government's prisonlike complex that holds suspected illegal immigrants closed, but the private company that owns and operates the 1,000-bed complex is working on a 30 percent expansion. The American Immigration Council report criticizes the immigration detention process as lacking “public accountability and transparency.” Under U.S. law, immigration detention is categorized as civil and “non-punitive” rather than criminal, but at the same time immigrants are not granted the same legal protections given to citizens charged under the criminal code. The more than 600 immigration detention facilities in the United States are essentially prisons with inmates issued uniforms, guards enforcing rigid rules, and limited communication and access to the outside world. More than 65 percent of immigrants are held in privately run facilities that critics say are incentivized to cut back on basic care and extend detentions to increase profit margins. 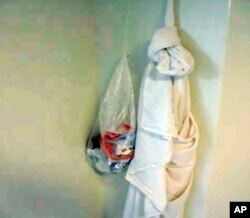 This May 1, 2018, photo from the Department of Homeland Security's Office of the Inspector General shows a noose fashioned from bedsheets in a cell at the Adelanto Detention Center in Adelanto, Calif. The OIG issued a scathing report of the privately run GEO Group detention facility. There were at least seven suicide attempts at the facility between December 2016 and October 2017, and a 32-year-old man killed himself by hanging in March 2017, according to the report. This year, protests broke out at the privately run Adelanto Detention Facility in Southern California after guards were accused of using excessive force to end a hunger strike by detainees protesting what they claim was the lack of clean water, quality food and clothing at the facility. The advocacy group Human Rights Watch also blamed the Adelanto facility for the deaths of at least three immigrants during the past eight years because of “dire health and safety conditions” at the detention center. The budget for immigrants in detention facilities has also increased significantly. The cost to the U.S. taxpayer for holding an individual in a detention facility is more than $126 per day, and in 2017 the budget for immigrant detention centers exceeded $1.4 billion.